Happy Wednesday, friends! Whew what a week it has been so far. We got back into town on Saturday from a wonderful time in Charleston, SC. I have so many fun looks that I wore while in Charleston to share with y'all, so stay tunes for that! But this week has been a whirlwind. Madeline turns three on Easter Sunday. I do not know how it's possible. I blinked and now my baby girl is turning three. Anyways, her birthday party is Saturday, and there is so much to be done with so little time to do it all. I decided to craft 85% of the decorations this year. With school consuming so much of my "free time", I have ended up putting off making everything for her party up until this week. Yikes! Crossing my fingers it all comes together. I'll keep y'all posted :) So much planning has gone into her party, and I just want it to be perfect for her. She is so excited! In other news, I can't believe Easter is this Sunday! Do you have your Easter look planned out yet? I have been so excited to share this mommy and me look with y'all, because I think it is more than perfect for Easter. A little story behind our looks: Madeline and I have always loved giving each other butterfly kisses. She thinks it's the funniest thing. She loves for me to tickle her cheeks with one, and I love to hear her sweet giggles as I'm giving her one. She tries to give me one back but still can't quite figure it out haha. Overall, it's the sweetest thing, and butterfly kisses will always hold a special place in my heart because of it. So, when I found this ruffle sleeve butterfly print dress for myself, I got so excited and immediately started searching for one for Madeline. Well, I came across this precious one for her AND these Mini Melissa (our favorite shoe brand) butterfly shoes. I got so excited over this look and think it's the sweetest thing. Another funny story, it took three tries to actually make these photos happen! The first try, I forgot to bring Madeline's dress to the shoot. The second try, I forgot her butterfly shoes!! And the third time, it just didn't work out. To say I felt scatterbrained would be an understatement haha, Anyways, the fourth try, we finally got these photos, and I'm so excited to share them with y'all. I also want to mention a few details about the sizing information for the pieces we're wearing. My dress is in junior sizes, so be sure to go up one size as it runs a tad bit small! It's such a gorgeous dress and has the prettiest details. I love then length. The ruffle sleeves are also adorable. I think it's such a perfect dress for all spring long. Oh, and it's under $60! Madeline's little dress runs TTS. She's tall, so it fits a bit shorter on her, as many pieces to. But I did go with her regular size, and it fits perfectly. These Mini Melissa shoes do run a bit large. I got Madeline her normal size, and decided to go with it even though she has some room to grow with them. Also, I'm also sharing some of the cutest Easter basket ideas below. 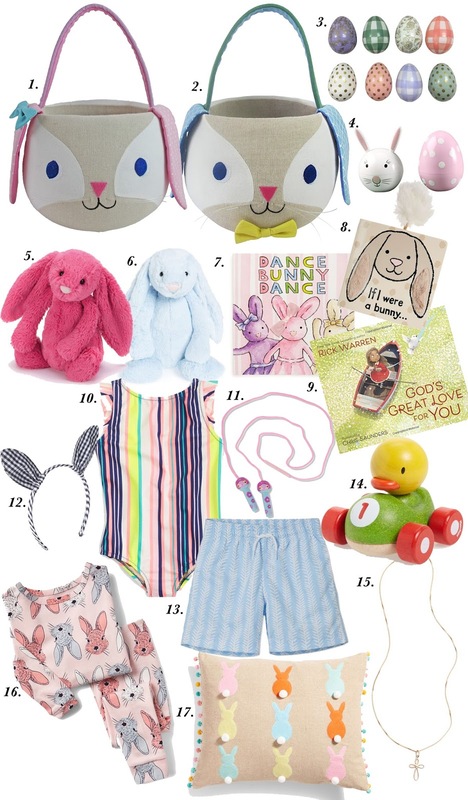 If you're stuck on what to put in your kids' Easter baskets (for both boys and girls), I hope this helps :) There are some of the most adorable things for Easter. Goodness do I love this time of the year! Thanks so much for stopping by, friends. I hope y'all have a great Wednesday!